I’ve gotten several questions as to the status of Pear Note on Snow Leopard. The short answer is that Pear Note 1.3 works fine on Snow Leopard with one major exception. Importing most Keynote and Powerpoint files will fail on Snow Leopard. I have a fix for this that I have pushed out in the latest beta release, Pear Note 1.3.1b1. Assuming I hear no problems from this, I will release Pear Note 1.3.1 to fix the problem very soon. If you are a beta tester and are using Snow Leopard, please update to 1.3.1b1 and try out Powerpoint or Keynote document importing. Please let me know if you have any problems. Also included in Pear Note 1.3.1b1 is a change to the way video recording is handled when used on Snow Leopard. As some of you are aware, Leopard’s support for USB webcams can sometimes be touchy. Snow Leopard has some new features that allow me to try to mitigate this, which Pear Note now utilizes in 1.3.1b1. So, if you’ve had problems with your webcam in Pear Note (for instance, if video occasionally freezes), I suggest trying again when you have Snow Leopard and Pear Note 1.3.1b1 or later, as the problems will hopefully go away. If you’ve encountered a problem with Pear Note on Snow Leopard other than this, please let me know. 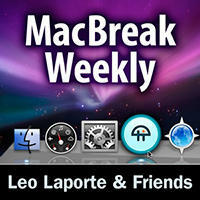 Pear Note is Leo Laporte’s pick of the week on this week’s MacBreak Weekly! Thanks very much to Leo for the kind words about Pear Note, and for being such a great tech journalist. Leo actually helped lead me down the Mac path back when he was the host of The Screen Savers, and I still enjoy listening to him today on shows like MacBreak Weekly. Cream sugar and butter. Add eggs and sifted flour, baking powder and salt. Add vanilla and nuts and mix well. Pour into greased pan. Bake in 9×13 pan for 30 minutes at 350 degrees. Sprinkle with powdered sugar and cut into squares. If you bake this in a 9×13 pan, the chewies will be kind of thick. If you want them smaller, use a jellyroll pan or cookie sheet. They will be thinner. At long last, Pear Note 1.3 is now released. This has been a long time coming, and it is finally here. There were a couple of key features that many of you have repeatedly reminded me were really needed in Pear Note, and 1.3 has them. They are Highlighting and Quick Lists. One of the key focuses of Pear Note is making it easy to find the information you’re looking for. 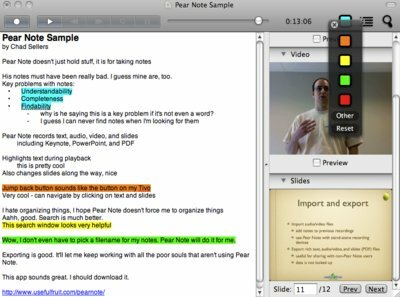 Between the timeline linking audio, video, text and slides and the search feature that makes it easy to find the right note, Pear Note is unparalleled in putting the right information at your fingertips. However, there has not been an easy way to indicate the certain text was important so that you could pick it out later. So, Pear Note 1.3 adds highlighting support, providing a simple mechanism to emphasize certain text in your notes. Make sure to try Option-clicking the highlighting icon to see how easy it is to use separate colors if that floats your boat. While Pear Note has had support for lists/outlines for some time now, it took too many clicks to start one. Consequently, many users just faked their own outlines in their notes. Pear Note 1.3 includes a new features – Quick Lists. With Quick Lists, you can simply click a toolbar item to start a list (Option-click for a numbered list) or hit a keyboard shortcut. You can still go through the menu if you want to customize the format of your list, but for most uses you will no longer have to interrupt your workflow to start an outline. Just click the toolbar button or hit Cmd-L (Cmd-Option-L for numbered) and your list will begin. There are several other features and bug fixes in Pear Note 1.3, including a new preference for the default font that I know many of you have been looking for. Download it to check them out.